The Addi Stitch Counting Frame & Needle Gauge combo is a must have when you work with Addi needles! This handy frame will become your new favorite tool! 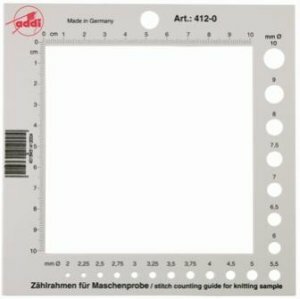 This frame is used for both counting stitches and gauging needles (sizes 2.0 mm - 10.0 mm), but our Addi needle gauges will ONLY work with Addi needles, as they are designed to the exact metric sizes. Other needle brands will not gauge correctly on this tool! Soak Basins - Phil - Blue and LickinFlames Yarn Bowl - Medium - Foggy Dew River are both similar accessories: specialty tools. LickinFlames Yarn Bowl - Medium - Foggy Dew River From $42.00 to $70.00Select options on sale now! Jimmy Beans Wool Jimmy's Journey Marketplace - Parveen Crafting Scissors From $8.36 to $11.95Select options on sale now! Knitter's Pride Knit Blockers - Jimmy Beans Rainbow From $25.00 to $27.50Select options on sale now!